Asian American and Pacific Islander (AAPI) groups are among those slamming the Trump administration for its decision to end an Obama-era executive action that allowed undocumented immigrants who came to the United States as children to remain in the country. Criticism has been sharp and pointed after Attorney General Jeff Sessions made the much-anticipated announcement Tuesday about what Trump called the “wind-down” of the Deferred Action for Childhood Arrivals (DACA) program, signed by then-President Barack Obama in 2012. Under the plan, the Trump administration will stop considering new applications for legal status dated after Tuesday, but will allow any DACA recipients with a permit set to expire before March 5, 2018, the opportunity for a two-year renewal if they apply by Oct. 5. Congress will have a six-month period to possibly save the policy. The Development, Relief, and Education for Alien Minors (DREAM) Act, a bill to put undocumented immigrant children on a pathway to U.S. citizenship, has been reintroduced and repackaged over the years, but has never passed Congress. “The legislative branch, not the executive branch, writes these laws — this is the bedrock of our Constitutional system, which I took a solemn oath to preserve, protect, and defend,” Trump said. DACA has helped temporarily remove the threat of deportation for undocumented children of Asian descent. According to federal immigration statistics, four of the 24 top countries of origin for DACA recipients are in Asia — South Korea, the Philippines, India, and Pakistan. Asians made up 10 percent of the population potentially eligible for DACA, according to a September 2014 report from the nonprofit Migration Policy Institute. 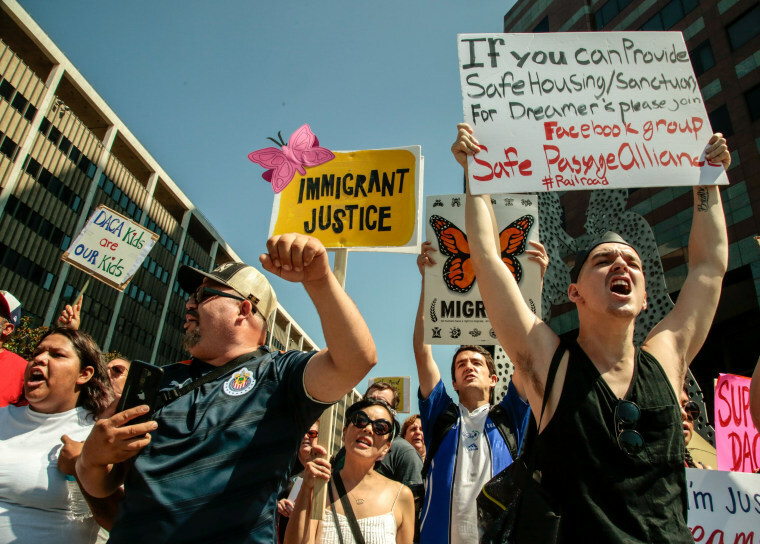 Advocates of DACA argue that deferred action increases economic opportunities for recipients who have grown up in the U.S., allowing them to earn higher wages and contribute to the country’s economic growth. But critics, including the U.S. attorney general, charge that Obama overstepped his constitutional authority by changing immigration policy through an executive action. At least a dozen AAPI organizations across the country Tuesday defended DACA and lashed out at the Trump administration’s choice to phase it out. “DACA is a legal, successful, common sense policy that has transformed the lives of the nearly 800,000 young immigrants,” John C. Yang, president and executive director of Asian Americans Advancing Justice | AAJC, said in a statement released by the National Council of Asian Pacific Americans (NCAPA). Quyen Dinh, executive director of the Southeast Asia Resource Action Center and NCAPA chair, expressed deep disappointment over the DACA decision. “We stand ready to fight and protect families that will suffer the repercussions of this heartless policy decision,” Dinh said in a statement. “We call on congressional leaders to defend the rights of all immigrants and refugees by enacting long-term, humane legislation that protects the vulnerable and keeps families together." There are approximately 154,000 individuals with DACA expiration dates between now and March 5, 2018, according to the Department of Homeland Security. One AAPI Republican group also weighed in on Tuesday’s announcement. Cliff Li, executive director of the National Committee of Asian American Republicans, told NBC News by phone that AAPI conservatives were split over the move to end the controversial program.